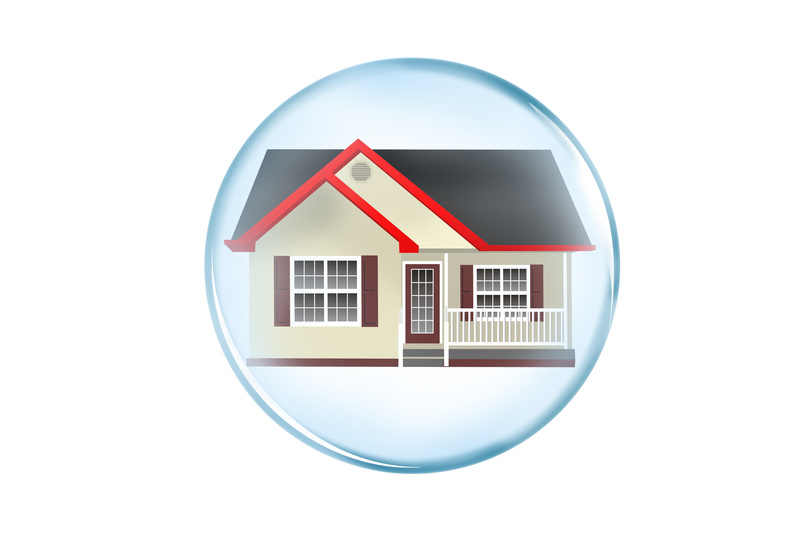 Talk of a housing bubble is starting to rear its ugly head, as reminders of the last market crash still linger. Media coverage has been extensive over the past several months. In particular, a couple of recent articles in the Orange County Register caught my attention, one by Jonathan Lansner, and another by Jeff Collins. Lansner’s piece was interesting, with contrasting views from two well-known local economists – Jim Doti, President Emeritus of Chapman University, and Mark Schniepp of California Economic Forecast. Both agree that constrained supply is affecting prices, although Doti’s overall view is generally less optimistic, noting that home prices are growing faster than paychecks, with the expectation that economic growth may eventually suffer. Schniepp references the strength of the economy, low unemployment and interest rates, citing important differences relative to the last market meltdown. With the media starting to address the potential of a price bubble in California (and other states), it seems prudent to examine whether home prices are indeed inflated relative to fundamentals. A good comparison is to look at prices relative to income, a factor cited by Jim Doti when he expresses concern for the long-term impact on the economy (see my previous post about Doti’s take on Housing Affordability and the California Economy). Monthly median prices of existing detached homes were obtained from the California Association of Realtors for five geographic areas – the state, Orange, Los Angeles, San Diego and San Francisco Counties. Federal Reserve Economic Data (FRED) on median household income was obtained for the same geographic areas, published annually as of January of each year. 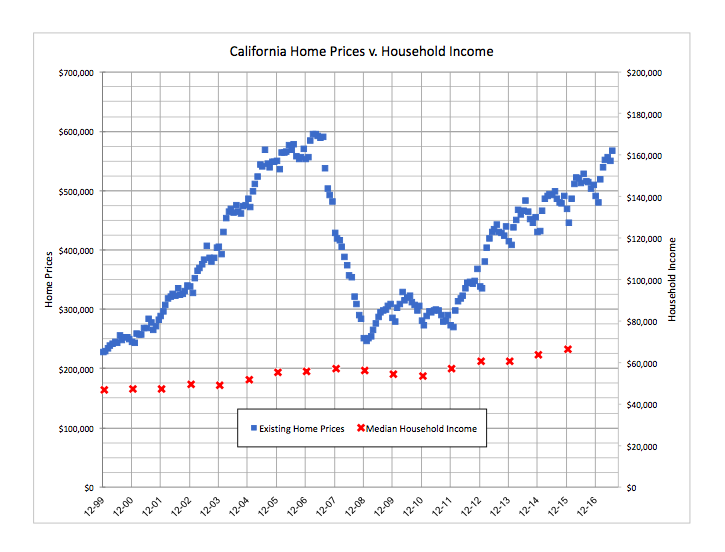 Below is a chart showing California home prices v. household income for a period dating back to January 2000. It is immediately apparent that the state’s housing market increased substantially during the first part of the last decade, with the median price declining by more than half over the 18-month period from mid-2007 through early 2009, and subsequently recovering most of the lost value. Some areas, in fact, have more than recovered, reaching new highs, while others are still below the market peak. At the same time, while household income has clearly increased (with declines during 2008-10), the magnitude of the changes is much smaller and the pattern much more stable. Over the entire period from January 2000-January 2016, the aggregate increase in home prices was 106%, compared to only 42% for median household income. The disconnect between home prices and income is even more pronounced looking at what happened before the market crash, from January 2000-January 2007, a period when incomes increased 19%, while home prices reflected a whopping 143% increase, fueled in large part by easy credit and loan products designed to reduce monthly payments. After the market stabilized in 2009, home prices increased 64% relative to a 23% increase in household income. A disconnect, to be sure, but far less dramatic than what happened from 2000-07. Data was also examined for the four counties (Orange, Los Angeles, San Diego and San Francisco), although estimated household income was only available through January 2015; while the numbers are different, the patterns are not dissimilar. Another useful metric is the relationship of median home prices to median household income, and how this ratio has changed over time. 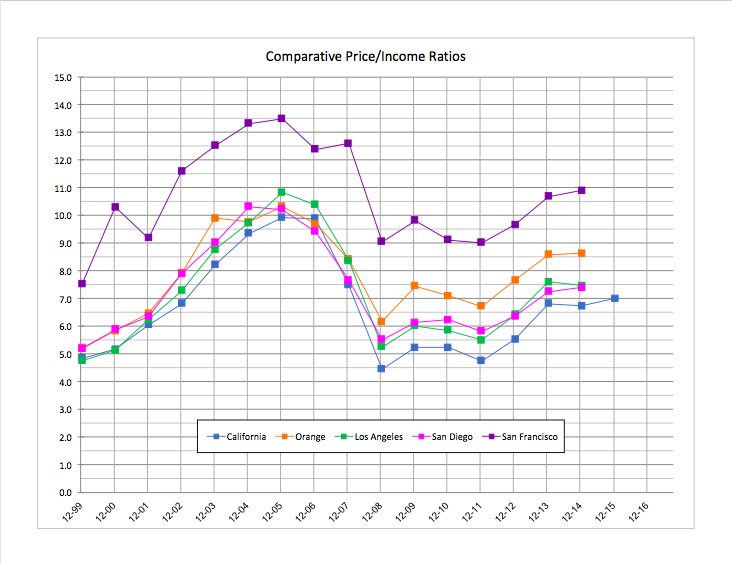 The chart below is illustrative, showing price/income ratios for California, as well as for Orange, Los Angeles, San Diego and San Francisco Counties. The substantial increase in housing prices during the first part of the last decade is reflected in price/income ratios that increased consistently and significantly through January 2006, declining through January 2009, with mostly sideways movement through January 2012, and subsequent increases (county income data from FRED was only available through January 2015, as noted). San Francisco County, not unexpectedly, reflects ratios that are higher than for the state and other Southern California counties. While price/income ratios have clearly increased in recent years, the numbers are still lower than those in January 2006 prior to the last crash. Interesting to note, however, that higher-priced counties (Orange and San Francisco) are only 16-19% lower, while ratios for the state and other counties with lower price points (Los Angeles and San Diego) are 28-32% less than peak values in January 2006. The case for a pending price bubble certainly has merit, although it is less compelling than in January 2006-07. Not only are price/income ratios below their peak, but borrowers are less extended and the supply of homes for sale is relatively low. It is important to remember, however, that statewide and county-level data does not capture the nuances of markets that are stratified in multiple ways – by location, price level and product type, for example. History has shown that different markets and product types can and do exhibit different price patterns in response to market conditions. Prognosticating about a housing bubble and possible correction, the local economy is certainly important – job growth and unemployment, in particular. Two other metrics to watch are interest rates and transaction volume. The U.S. average for 30-year fixed rate loans has consistently been under 5% since early 2011, and less than 4% for most of the past three years. Federal Reserve policy going forward will likely have an (indirect) impact on long-term interest rates. The other important metric is transaction volume, noting that diminished sales velocity is often a leading indicator of a subsequent price decline. There hasn’t been any significant evidence of an overall drop in transaction volume (other than seasonality) to date, but it is something to watch going forward. At the end of the day, the timing and magnitude of a potential market correction are impossible to predict, but warning signs are definitely getting attention. Previous PostPACE Financing: History and Value RamificationsNext PostAre Home Prices on a Collision Course with Tax Reform?